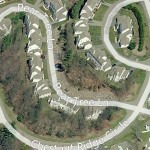 The second phase at the Chestnut Ridge Condominiums in Franklin, MA (Chestnut Ridge II) comprises 75 homes built between 1995 and 2001. A few additional homes went constructed in 2005 as development concluded. 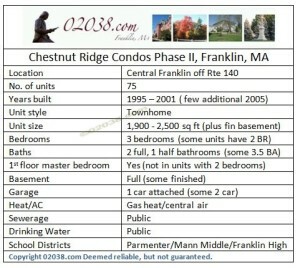 Most of the homes in Chestnut Ridge II in Franklin, MA have three bedrooms. With these units, the master bedroom (with a master bath) is on the first floor. Two more bedrooms are on the 2nd floor. 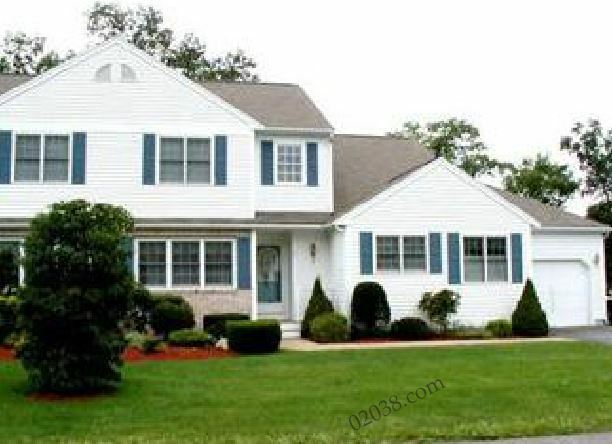 These floor plans are very popular because many buyers seek first floor bedrooms. Chestnut Ridge II is not age restricted; any one of any age can live at Chestnut Ridge II. Unit sizes range between 1,900 and 2,500 sq ft (exclusive of finished basement space). Most homes have 2.5 baths. Some units offer 3.5 baths. One car garages predominate; a few units have 2 car garages. All homes at Phase II have wood clapboard siding, gas heat and basements. A number of the streets in Phase II end in cul-de-sacs. This helps eliminate drive-through traffic on those streets. Other roads in Phase II wind though the community in gentle loops. The layout of the roads at Chestnut Ridge II enhances the community’s peaceful, serene ambiance. Follow the hotlink to see photos and a video on Phase I of Chestnut Ridge. 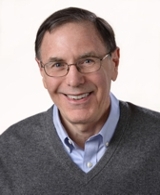 Learn more about other condo communities in Franklin here and access a wealth of information about the wonderful lifestyle afforded by Franklin, a bustling community of over 30,000 in the I-495 growth corridor of Massachusetts.